How do you introduce mindful eating during MNT? - Am I Hungry?Am I Hungry? 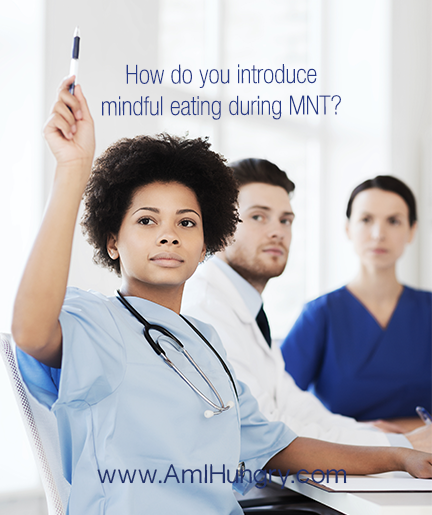 How do you introduce mindful eating during MNT? I’d like some suggestions on how to approach 1 hour MNT sessions with new patients in which we have a limited number of sessions (1-3 in many cases). More specifically, how do I introduce mindful eating and blend that with carb counting education and the Eat What You Love, Love What You Eat Plate method for an intro MNT session without trying to cover too much or make it overwhelming for both me and my patients! First, let’s review the difference between DSMT and MNT. What are DSMT and MNT? Diabetes Self-Management Training (DSMT) is a benefit for Medicare Part B beneficiaries who have diabetes. The purpose of Medicare’s DSMT benefit is to give beneficiaries the knowledge and skills needed to adopt diabetes self-care behaviors and to make lifestyle changes needed to improve health outcomes. Beneficiaries are covered for a total of ten hours of initial training (1 hour for an individual or group assessment and 9 hours for diabetes education in a group setting) within a continuous 12-month period, and two hours of follow-up training (individual or group) each year after that, as needed. To qualify for reimbursement, these DSMT services must be part of a plan of care prepared by a physician or qualified non-physician practitioner (QNPP). In addition, the services must be furnished by a DSMT program that has been accredited by either the American Diabetes Association (ADA) or the American Association of Diabetes Educators (AADE), the two CMS-approved national accreditation organizations. Both AADE and ADA use the National Standards for Diabetes Self-Management Education (NSDSME) as their guiding principles for accreditation. When indicated, the Am I Hungry? Mindful Eating for Diabetes Program may be used to provide the content for MNT sessions, as Megrette and Christine demonstrate during the recorded call (at the bottom of this post). During this call, we also talked about several resources that support diabetes education, including Mindful Eating with Diabetes handouts and Eat What You Love, Love What You Eat with Diabetes. Click here to access these resources. To listen to the audio recording, simply provide your name and email address below. Please share your comments and questions! I listened to the recorded session by Megrette and Christine. It was so very valuable to hear about incorporating the mindful eating concepts into an individual MNT session! Well done! I have been practicing as a dietitian and diabetes educator for years and know the challenge of having a valuable session while feeling the pressure to provide the essential info for diabetes education. Thank you so much, I am now super motivated to take the AIH for diabetes training!